Jenny’s mind skips like a stone on a lake, skimming across the years. She is paralyzed with joy, she is radiant in tears. At each point, she experiences that moment more deeply than you’ve ever felt anything. Every memory is available to her, in its most devastating form. She is more alive than you could ever be. This offer is available for a limited time. At the moment, Jenny is hyperventilating in the corner of a dusty basement, her mind buzzing with madness and pain, as her sister tries to convince her not to tell anyone that she’s just seen a dead body in a coffin. This may be the single gloomiest thing ever filmed. And this is the first week of May, at 4:00 in the afternoon. It’s probably sunny outside. Children have come indoors on a perfectly nice afternoon to sit in front of the television and watch two women huddling in the dark, having nervous breakdowns. The problem — one of the many problems that Jenny creates on a minute-by-minute basis, just by existing — is that she opened the coffin and saw Barnabas’ dead body. Thinking about death happens to be a hobby of hers, so she’s chattering away, while Magda tries to impress upon her the importance of buttoning her lip for five seconds. “If you tell one person,” Magda urges, “you will die, I will die, Sandor will die!” Jenny disagrees. “But you cannot keep a secret of death,” she says, “any more than of life.” This is shaping up to be one of those long afternoons. This show is now almost exclusively about regret, just one unintended consequence after another. On other soap operas, people are falling in and out of love, getting sick and getting better, accumulating experiences and making something out of their lives. 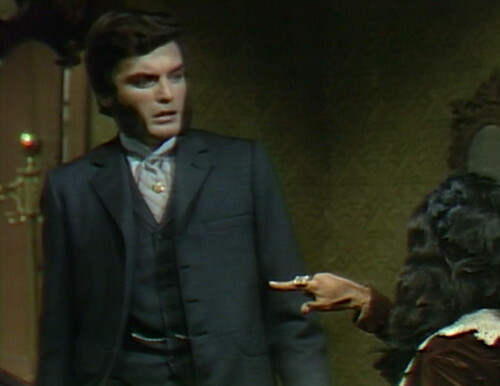 On Dark Shadows, people are threatening to annihilate each other pretty much full time. So here comes Quentin with yet another murder weapon, a homemade garrote that he probably found in the children’s toybox. He’s Jenny’s almost-ex-husband, and he’s determined to get her out of his life one way or another. The idea of leaving town for five minutes until she falls down the stairs or gets obsessed with somebody else does not seem to have occurred to him. On Friday, he promised Beth that he would stop trying to kill Jenny, which I figured would free up some time that he could use trying to kill Laura. Quentin is never really happy unless he’s plotting to eliminate somebody; that’s why he’s our hero and the new star of the show. Hey, do you guys remember back in the day, when the show was about the Good People glaring sternly at the Bad People? Back when we had Vicki and Burke, Maggie and Joe, a whole assortment of characters that weren’t actively trying to slaughter, disinherit and/or defraud each other? Well, those days are over. At this point, the only happily married couple is Magda and Sandor, and the only loving family relationship is Magda and Jenny. It turns out that Magda is the only person on the entire show right now who is capable of maintaining emotional bonds with anyone. And this week, her storyline is about threatening Quentin and destroying the Collins family. To start with, she drops a truth bomb on Quentin, because nobody’s secrets are safe anymore. We found out late last week that Jenny is Magda’s sister, and the new rule of the show is that once a secret is revealed to the audience, it gets communicated to everybody so that the characters are free to accumulate more revenge plots. Magda: She knew you. She was not fooled by you. She knew that you would never marry a gypsy girl! That’s why she did it. Now she is broken, torn, and you — you are responsible! You did it to her. I will never let you forget it, Quentin, never! Quentin: What are you going to do, kill me, Magda? Magda: Killing would be too kind. All my life I have waited, because I have been prepared to meet an enemy. At last I have met you! I know what to do. Magda: Stay away from her, Quentin. You have seen for the last time! Quentin: If you could only guarantee that. Quentin: What are you going to do, Magda? Magda: You don’t need to know. Go back, like the good child you are, go back and tell your family. Tell my newly-discovered in-laws what you have discovered about us. And then listen to their advice, but do nothing, Quentin — because you will not be able to fight me. Now, get out. So, again: the only character who loves her family. Man, Thanksgiving at Collinwood is going to be tense this year. Magda checks on Jenny, who’s screaming and sobbing upstairs, and then it’s down to the basement for a staff meeting. 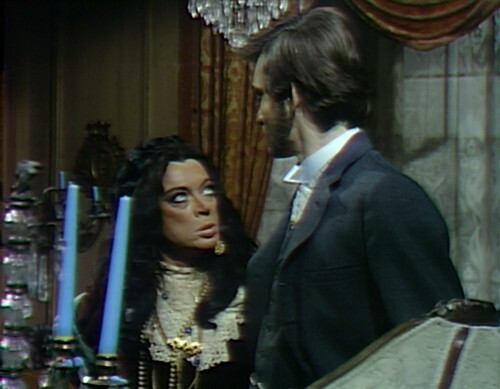 She tells Barnabas that she’s Jenny’s sister, and she needs him to release Sandor so that they can take Jenny away, and meet up with the caravans. This happens to be the one instance in history when “running away to join the gypsies” is actually the most sensible plan, so naturally Barnabas has to refuse. He does this by inventing more extemporaneous time travel theory. Barnabas: You know why I’m here, in this century. There are two lives that I must save — two lives that live a hundred years in the future. Magda: Yes, but my sister has nothing to do with that! Barnabas: She has! Now, perhaps at the time she ran away to this house, but I was not here. The house was empty, except for you. But I have changed that. I locked her in her room. You wouldn’t have even known she was in Collinwood if it hadn’t been for that. The story must be played out as it did originally, or I will never be able to save either David or Chris. Naturally, this theory is pure horseradish, just nonsense that he’s making up on the spot so that he can do whatever he wants to do. 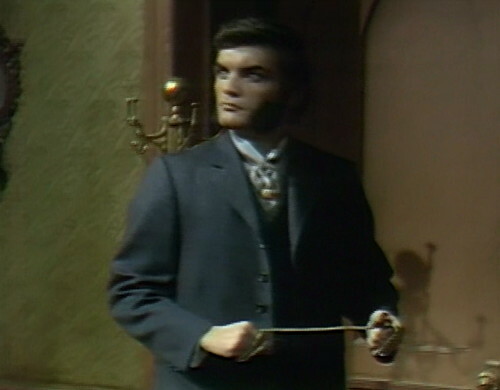 He’s been interfering like crazy all over the place, up to and including ten minutes from now, when Jenny runs away and Barnabas helps Judith search for her. He’s also helping Quentin fight Laura, who was definitely part of the “original” timeline, if there ever was one. But Magda cares about her family and she’s making rational decisions, which means that Barnabas has to stop her at all costs. Magda imagines that she can find freedom and safety among her own people, a happy ending that would make life better for everyone involved. Barnabas, Judith and Quentin should be thrilled with this idea; they should be helping her pack. This is an actual solution for several agonizing problems. 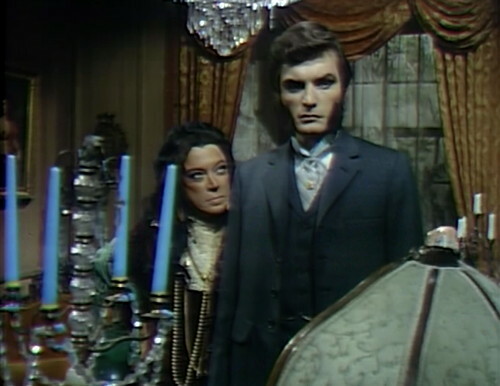 Obviously, that means it can’t happen, not on Dark Shadows. For one thing, it would take Magda off the show, just at the moment that she’s broken out of her ethnic comedy-relief role and revealed herself as a powerful, story-productive kaiju. 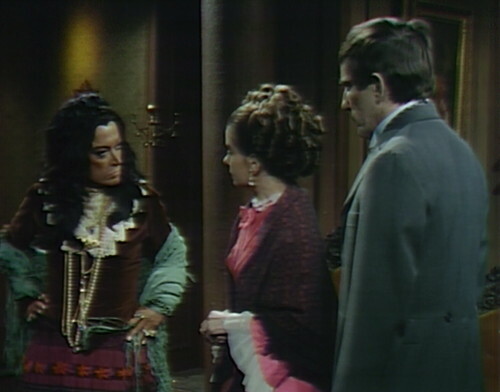 This is the moment when Magda truly becomes as important to 1897 as Julia is to 1969, which means we have all four of the show’s Major Arcana activated at the same time — Barnabas, Quentin, Angelique and Julia/Magda. All of a sudden, Magda is the trickster gunslinger, who can stare down every other character and threaten them with whatever frightens them most. She represents humiliation for Judith, failure for Barnabas, and implacable vengeance for Quentin. She’s too important to be happy. This is Dark Shadows. Happy endings are for other people. When Jenny pulls on the door in Josette’s room, the wall shakes. As Jenny unravels on the bed, saying, “Then he will love me… Yes, he will,” there’s a lot of studio noise — footsteps, something banging, a little bit of talk. The scene dissolves to the establishing shot for the Old House, with some dognoise. As the dog howls, you can hear somebody turn a mic on, with some squeaks and a bit more talk. Honestly, if you listen to the show with headphones with the volume turned up, it’s like listening to two different shows sometimes. 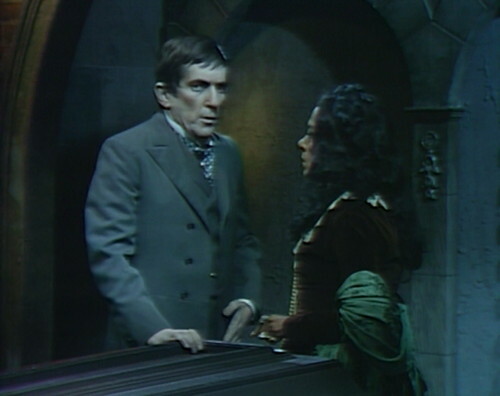 Barnabas tells Magda, “I want have — talk with her and ask her many questions, and I don’t want to be dith-disturbed when I’m with her.” There’s also the “Two lives that live a hundred years in the future” thing, quoted above. When Barnabas and Judith talk in the Old House, there’s more studio noise — footsteps, a door opening, and somebody coughs. According to Barnabas, Jenny ran to the Old House in the original timeline and only Magda was there. So, Magda apparently found Jenny in the original timeline, so Barnabas really hasn’t really changed anything other then lock Jenny in a room. And he knows this how? Quentin wasn’t exactly chatty as a ghost. It’s unlikely the saga of Jenny and her gypsy relatives made it into the Collins family history. Barnabas just guessing what happened the first time. And if Jenny came to the Old House and only Magda was there, then Magda would have scooped her up and they’d be riding with the caravans by now. Barnabas is bad at this time travel racket, because Barnabas is bad at everything. But there would be no curse. When that song first came out, my friends and I thought Cher was saying “Gypsies Trampanzees.” Okay so we weren’t the brightest kids in the 9th grade. Originally, perhaps Jenny got away from Magda and ran off to Collinwood. FYI – I was just going through new AMAZON streaming listings and noticed that they now are offering the early DS (1966) episodes 001-209..if anyone wants to see Laura Collins in all her ‘flaming glory’ – it’s really much creepier than this storyline..
All the early episodes up to and including 210 are available for free on YouTube as well. Beginning with 211, there’s a $1.99 price associated with each episode. That’s over $2,000 if you want to follow the rest of the series to 1971. It’s cheaper to get the coffin box set with the 1966 episodes plus all the extra features, which I got for around $500. I was wondering about them still being on YOUTUBE also – it seems that they are really clamping down on deleting a lot of full episodes of different shows (I guess due to copywriting or something) – most of the shows I was watching seem to have been deleted from YOUTUBE..
It’s interesting that they keep mentioning Barnabas’s “mission,” as though there is a dramatic need to justify his presence in the past. One thing I especially like about Parallel Time is that there is no “mission” (or rather an anchor to the previous timeline). Barnabas gets stuck in PT and doesn’t leave (even when he can) because he gets involved in the many problems there. He is on a mission- and didn’t plan to go back to 1897, just to speak to Quentin through the I Ching door. He doesn’t even know if he can get back to 1897, so he’s making the best of it. That image of Magda holding out her hand at Quentin in the Old House foyer, there’s a closeup of her hand just before the scene ends, with her thumb and two fingers extended and the two inner fingers folded…. Wasn’t that the same symbol later used by heavy metal bands and their fans? Magda rocks, seriously hard! Magda’s giving him the Evil Eye (malocchio). Many cultures have similar hand gestures, meant to either ward off or evil, or curse someone. Did some wiki-research and Ronnie James Dio of Black Sabbath gets credit for popularizing it, and he claims to have gotten the idea from his Italian grandmother. Granny Dio rocks, too! I think the face boggle emoji was invented purely for use when Barnabas starts talking about time travel. A favorite line of mine from the series is I believe from this very episode. Magda yells at Quentin to get out of the Old House and Quentin digs a knife in Magda when he says that Jenny should have told him she was a Gypsy because “it would have made her much more interesting.” Magda immediately picks up a vase and throws it in Quentin’s direction and he (David Selby actor) appears to be genuinely startled when it crashes. I always thought the breakaway vase may have gotten a bit too close to the actor’s head and caused him to be genuinely startled before quickly leaving the house. If any of you have access to that episode and scene it’s definitely worth a slow motion viewing. Also, consider for one moment that Quentin Collins would have happily brought a Gypsy girl home to Collinwood — and the reaction that both Judith and Edward would have had and it makes me love Quentin all the more. And that’s a helluva twisted admission.